When we get older we lose volume in different areas of the face and our skin becomes loose and sags. This is due to the fact that we lose fat, our bone gets resorbed and we produce less collagen and hyaluronic acid. Dermal fillers are injected to replace the lost volume in our face which has the effect of tightening the skin giving us a more youthful appearance.The newest generation of dermal fillers are mostly composed of hyaluronic acid gel. Hyaluronic acid is a sugar which occurs naturally in our skin. There are different thicknesses of hyaluronic acid, used for different purposes. Thicker dermal fillers are used for providing lift, and structure such as injecting filler into cheeks to replace fat and mimic bone, whereas lips can be injected with a thinner filler to enable the client to maintain natural movement. Dermal Fillers are not permanent treatments. The effect from hyaluronic acid dermal fillers can last anywhere from 6 months to 18 months depending on the quality of the product injected and the area where the product is injected. 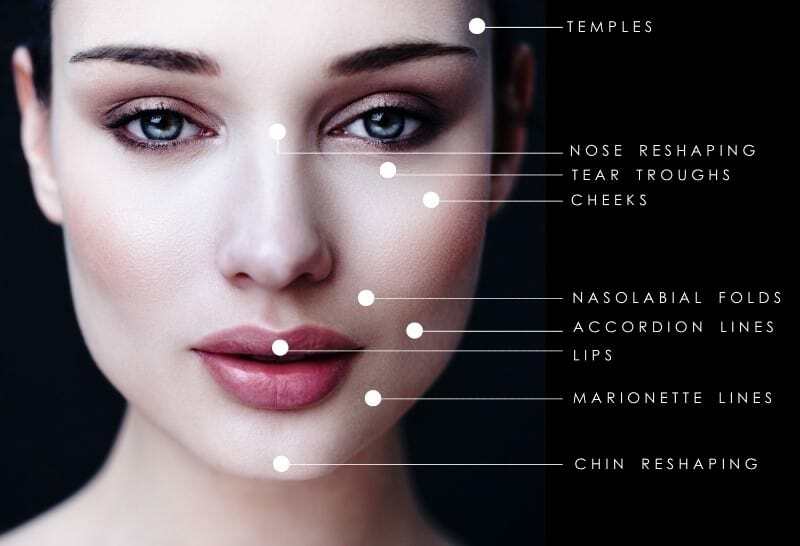 A combination of these areas can be treated with dermal fillers for more complete facial rejuvenation. Talk to our Cosmetic Doctor or Registered nurse regarding your specific areas of concern for specialist advice and a treatment plan tailored to you. Our staff are happy to advise you of cost prior to your treatment. As we age we lose volume in our cheeks due to loss of fat and bone reabsorption. Fillers can replace the lost volume in the cheeks and give a fuller more defined look. We can recreate the youthful V shape of the face. Adding volume to the cheeks also lifts the mid-face improving the nasolabial folds, those lines that run from the nose to the corners of the mouth. These are the hollow areas beneath the eyes. When we age we lose volume here which can then cause shadowing which gives the appearance of dark circles. Dermal fillers are injected here to replace volume and take away that tired look. Again ageing causes loss of volume in the lips and some people genetically are born with small lips or asymmetrical lips. Dermal fillers are used to restore volume, enhance definition, and improve symmetry to create beautiful luscious lips. These lines run from the corners of the mouth to the chin and give people a constant sad or angry look. Fillers can be injected to treat these. Accordion lines or extended smile lines are the static lines present on the outer-side of the mouth, caused by smiling or laughing. Dermal fillers can be used to treat these lines too. Hollowing of the temples, another sign of ageing, can be treated with dermal fillers, restoring lost volume helping to create a more youthful appearance. Filler can be used in the chin to create a more defined chin or to create a more proportionate face with those who have smaller chins or rounder faces. It can have a slimming effect for your face. A simple procedure that uses dermal fillers to acheive a more desirable nose shape. Some reasons for considering this treatment include – flat bridge of the nose, crooked or off centred nose, a bump in the bridge or hook in the nose tip.